We are pleased to announce that we have successfully completed the transition from ISO 9001:2008 to ISO 9001:2015. To achieve our Quality Management System, we have implemented a client-oriented philosophy of continuous business improvement. Therefore, we are proud to have achieved the updated version of the ISO 9001 certification - the world’s most recognized standard for Quality Management Systems (QMS). By achieving this level of certification, we continue to demonstrate the desire and ability to offer our customers the highest level of quality. All of our achievements are built on the foundation of our core values that inspire entrepreneurship, openness and responsibility. Our main mission is to deliver state-of-the-art services for the global management of Intellectual Property. We guarantee the quality of our services and products through our responsible and entrepreneurial acting. At Dennemeyer, we exemplify a culture of openness. The sharing of information and knowledge enables us to fulfill our duties. We continue to build and maintain trust by acting respectfully and reliably towards our customers. We are constantly striving to improve our products and services, as well as our internal processes. Our integrated management system is regularly reviewed and certified according to the latest standards. As part of the certification process, we have engaged in a rigorous audit of business, management and support processes. Management and employees of Dennemeyer aim for the highest internal and external customer satisfaction. We strive to meet and exceed customer expectations in terms of quality, delivery time and pricing, providing the best total value in compliance with all regulatory requirements. Our objective is to achieve on-time delivery of error-free products and services. Our daily approach in business is based on continuous improvement. To ensure that a Quality Management System is embedded within our organization worldwide, we have extended the ISO certification scopes to include all our regional offices and affiliates. The headquarter Dennemeyer S.A. in Luxembourg and its affiliates in China, France, Japan, Romania, Germany, United Kingdom, United States of America and Singapore are ISO 9001:2015 certified with the scope of providing Intellectual Property management services and Intellectual Property software. The law firm Dennemeyer & Associates S.A. in Luxembourg and its affiliates in Germany, United States of America, Romania, Poland, Dubai (U.A.E.) and Australia are ISO 9001:2015 certified with the scope of provisioning legal services in the area of Intellectual Property law. 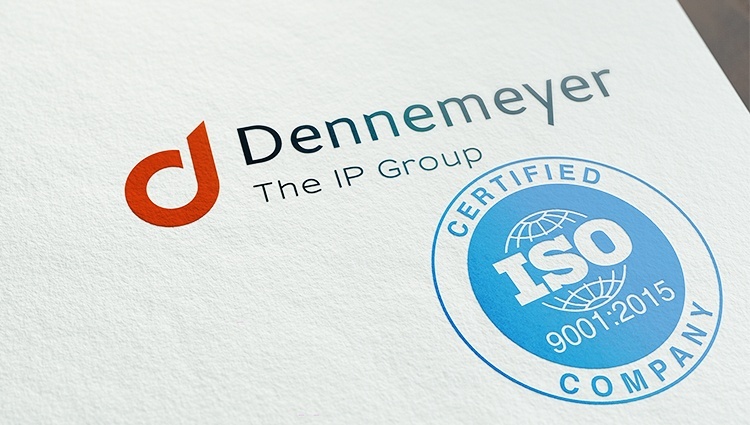 The Dennemeyer Consulting GmbH in Munich is ISO 9001:2015 certified with the scope of providing services in the area of management consulting and seminars specialized in Intellectual Property, technology and innovation management. Dr. Uwe Tenner joined the Dennemeyer Group in April 2009 as Global Head of Quality Management. He introduced a global quality management system which was certified according ISO 9001 in between two years. Now he is active in development and maintenance of an interactive quality management system. Dr. Tenner holds an engineering degree and a doctorate in electrical engineering from the Technical University of Ilmenau.